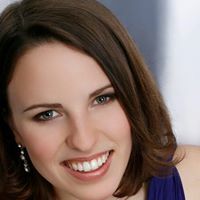 Coloratura soprano Lindsay McGinnis was one of six singers from five universities invited to sing at a masterclass presented by tenor Robert Brubaker on Saturday, March 1. Sponsored by OperaLancaster, the masterclass took place at the Ware Center on the campus of Millersville University in Lancaster, PA.
A second-year student in the Master of Music in Voice Pedagogy and Performance degree program, Lindsay performed the "Doll Aria" from Jacque Offenbach's Les contes d'Hoffmann. Robert Brubaker is originally from Mannheim, PA and has had a major career as a leading tenor in opera companies throughout the United States and Europe. He is especially well-known for his performances at the Metropolitan Opera in New York City as Mime in Richard Wagner's Siegfried.